Would you like to see a tiny little plane that was just used two days ago to set a World Aviation Record? 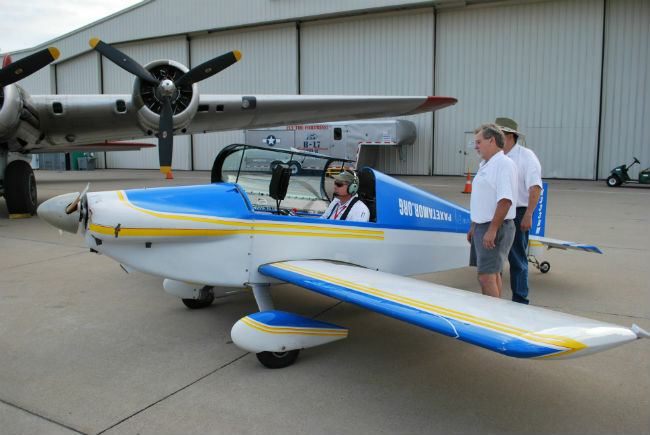 The Sonerai II aircraft flown by Brian “B.K.” Kissinger will be on display tonight (July 6) and tomorrow night (July 7) at the Malcolm W. Martin Memorial Park in East St. Louis from 5-9 p.m. each night before the Fair Saint Louis Fireworks Show. The park is located south of the East Riverfront MetroLink Station. 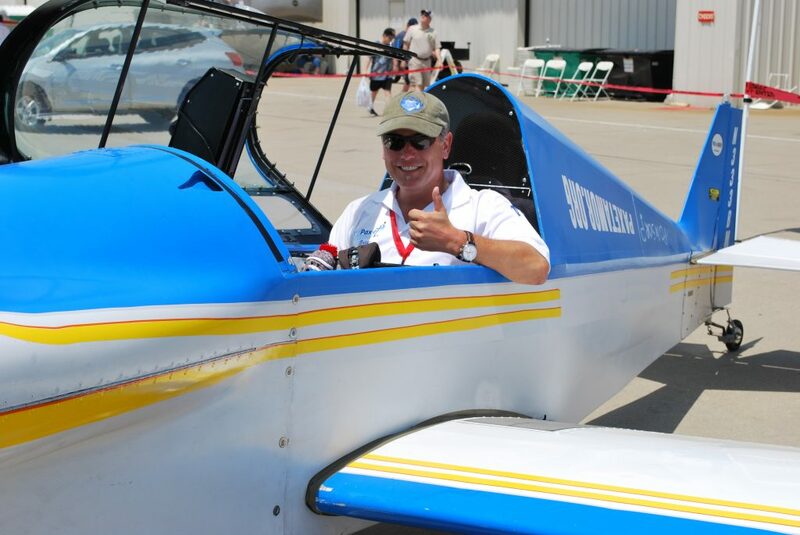 The two-time brain cancer survivor and pilot flew this experimental plane into the record books on Wednesday–setting a World Aviation Record for “speed over a recognized course” at Bi-State Development Agency’s St. Louis Downtown Airport in Cahokia, Illinois. Several hundred people who were attending the Fair Saint Louis Special Needs Air Show at the airport witnessed the completion of Brian’s record-setting flight. The record will not be official for several weeks though while the National Aeronautic Association and the Fédération Aéronautique Internationale conduct their final reviews before certifying the record-setting flight. Brian left St. Louis Downtown Airport at 6:35 a.m. CT on July 4th and flew to St. Joseph, Missouri. He refueled there and officially began his quest for a world record when he took off from Rosecrans Memorial Airport at 10:02 a.m. CT. He successfully completed the world record flight by landing at St. Louis Downtown Airport at 12:14 p.m. CT. with a time of 2 hours and 12 minutes. For Brian, this was not about getting all the fame and glory for himself. It was about meeting a goal for a good cause. This was a labor of day by Brian to raise awareness and money for The Joseph Center in East St. Louis. The organization helps homeless veterans until they can get back on their feet and get a place of their own. Veterans are near and dear to Brian. He’s one himself. He had to retire from the Air Force after he was diagnosed with brain cancer. After surviving the brain cancer, he found himself diagnosed a second time with brain cancer a few years ago. “I feel very blessed to have survived brain cancer twice and blessed that I can still fly and help others by doing something that I love to do,” Brian said. CLick here to see the slideshow on the world record flight. Brian’s record flight was sponsored by the Greater St. Louis Air and Space Museum, Experimental Aircraft Association Chapter 264, and Gateway Flight 26 Order of Daedalians, a fraternal organization of military pilots. Brian is a commercial pilot, flight instructor, and the pastor, founder, and CEO at Pax et Amor. We congratulate him on his latest accomplishment and are inspired that he is a cancer survivor who loves life and loves helping others.